War of the Ring (FFG/Nexus) – revision! Roberto di Meglio, one of the designers of the boardgame ‘War of the Ring’ has announced that a rules revision and an upgrade kit for the cards is currently in the works. He made clear that for all those who already own the the game there’s no need to buy a new version but a download of a pdf with the changes will be sufficient to be up to date with the current thoughts on the design. Because there will be some changes to the wordings of specific cards and the idea is to have cards that are easier to read (i.e. larger letters) there will be an upgrade kit available for those who own the game already, which will include cards, card sleeves, and a tin box to keep all of it. The designers also consider a change of the victory condition for the Shadow player, asking players whether 10 victory points for the Shadow is ok or that the Shadow should conquer more territories to qualify for a win. If you want to chime in on this discussion you can either answer Roberto’s question on Facebook here or as a member of BGG you can leave a post here in the relevant post. So, besides the news post here, we would like to say that there’s no need at all in our opinion to change anything in the victory conditions of both sides in the game. One can argue whether the expansion ‘Battle of the Third Age’ used all the opportunities that were clearly present (e.g. siege towers just a dice roll modifier…something more interesting and innovative would have been possible here) or even if the expansion is necessary to get the most out of the game, but there’s – in our humble opinion – no reason to bugger about with a game that is just fine as it is. 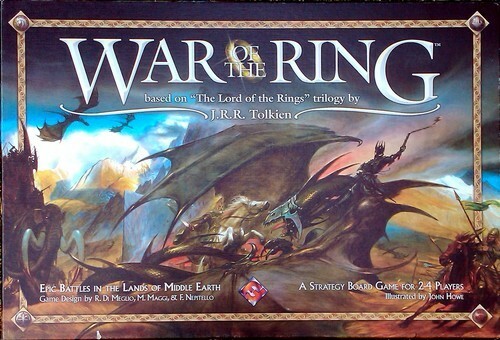 It works, it fits the overall story of Tolkien, it has the right atmosphere, it’s fun and gameplay is full of tension and it’s dropping with theme, in short there’s nothing wrong with it and one of the best LOTR wargames out there. Happy New Year – hopefully, a year full of new wargames (and old classics, of course!). Thanks again for keeping faith with the HFC and for your appreciation and great feedback! Christmas provided us with new games, so we spent the prolonged weekend around New Year with unboxing, glueing, and counter-punching. However, before trying one of our gifts, I had to solve a problem I was occupied with since early December: Andreas’ House Stark armies were still undefeated in the Battle for the Kingsroad in FFG’s A Game of Thrones: Battles of Westeros board game. This Friday, my House Lannister forces challenged House Stark to a return game! The game started as bad for House Lannister as the last game had ended. My armies were crushed under Stark’s bowmen, infantry, and cavalry. In the final turn, I didn’t have anything left besides my two leaders Kevan Lannister and Adam Marbrand and one lone 3-step Casterly Rock chevalier unit. My objective was to cross the River Trident and to occupy two strategic hexes which were heavily defended by Stark’s bowmen and Richard Karstarks cavalry. We discussed whether it was possible to fulfill the victory conditions with my poor, lonely units, but decided to play it out. And, as every experienced A Game of Thrones fan knows, things always turn out differently and with a big surprise you didn’t expect or see coming. This was also true for my game I had thought lost. My cavalry unit managed to lure Andreas’ infantry over the Trident, so that they couldn’t reach and defend the objectives in time. Kevan Lannister (without any accompanying men) escaped an engagement at the ford and rushed into one objective hex where he stood adjacent to Stark’s archers. Since he was a sole leader, he couldn’t be killed but had to be captured, but the bowmen were incapable of achieving enough hits to capture him. Kevan Lannister and Adam Marbrand, defending the objectives! Simultaneously, Adam Marbrand remembered his strength – riding through any terrain, even impassable, even a river, as long as his move ended in a legal hex. And so he galloped into the Trident, followed the river until he reached the objective and occupied the hex – again, adjacent to the bowmen who couldn’t capture him either. We then tried out Andreas’ Christmas present: The Hell of Stalingrad, a card game by Clash of Arms Games. This game proved to be an absolute blast, we got the hang of it really quickly, despite the fact that the structure of the rulebook isn’t optimal and you have to do a lot of page turning. We were immediately thrilled by the innovative and very cool mechanics, the impressing and quite explicit artworks, the historical photos, and the overall look and feel of the game. In our first game, I played the Germans and Andreas played the Russians. In the game, you have to fight for single historical buildings and locations (for example, the Tractor Works, Red October). It’s the German objective to capture the buildings and reach the Volga and it’s the Russian job to hinder them and to fight for each building. The combat system is extremely bloody and gives a very good impression of the chaotic, bloody, and desolate battle for Stalingrad. If you are interested in this movie, there is a dubbed version available, but I have read that the dubbing is terrible and completely destroys the atmosphere, so you should do yourself a favor and watch the German version with English subtitles! The problem is, even if you know some German, you will have a hard time understanding it without subtitles because most soldiers speak in various local dialects from Northern German to Prussian to Bavarian or Swabian or are shouting while under heavy artillery fire. In addition, working-class slang of some soldiers in contrast to the educated speech of the officers gives valuable insights into the background of the characters. A game I got for Christmas was the strategic board game “Zombie State: Diplomacy of the Dead“. This isn’t a wargame and you don’t shoot zombies either, it’s a strategic game where states have to deal with a zombie pandemic by sending the military, doing research to find a cure, or developing other technologies. We didn’t try it out yet, but it looks very promising and certainly is an unusual approach to the zombie topic. Last but not least, the brand-new “Hornet Leader: Carrier Air Operations“ by DVG reached our HFC test lab after being delayed by German customs. The box is very impressive with cool artworks and even the customs officer was impressed and couldn’t believe that this was a board game (he thought it was a PC game because it looked so modern and stylish). Hornet Leader is a Solitaire Game like its cousin Thunderbolt / Apache Leader, but like TAL, it can also be played with two players cooperatively. Watch out for our review where we will take a special look at the cooperative aspect of the game! We are also looking forward to the new cooperative The Lord of the Rings LCG by FFG which will (according to unconfirmed rumors) be published February / March 2011. 2011 will be a great and interesting gaming year (as was 2010), so stay tuned and visit us again for more information, reviews, and stuff! Introduction: What is the game about? “Marvel Heroes” is a strategy board game based on the classic 616-Marvel Universe. Two to four superhero teams (X-Men, Marvel Knights, Avengers and the Fantastic Four) compete against each other in solving “headlines” while simultaneously fighting their respective Nemesis (Magneto, Kingpin, Red Skull and Dr. Doom) and other major and minor villains. The main task is to deal with threats appearing all over New York City; these threats are of different types and difficulty levels. Each team consists of four members with certain strengths, weaknesses, super powers and special areas of expertise. In addition, each team member can be used either as an active fighter or as a supporter, which has a strong impact on their special abilities and roles in combat. If you decide to fight a threat, you first try to lower the “Trouble Level” by using your different talents and abilities in the respective NYC district. Based on the final Trouble Level, a prominent lead villain from the Marvel Universe appears at the scene, often supported by other villains. Your task is to fight these villains by using your special powers against the villains’ special powers and to beat them in the fields “attack”, “defense”, and “outwit”. Sometimes, a “Mastermind” is behind a threat – i.e. the super villain and Nemesis of the respective team. He can boost his subordinates and give them more advantages. After finishing off his infantry, the superhero team has to face the Mastermind himself. Over the course of the game, these Masterminds try to achieve a “Master Plan” consisting of three parts, while the superhero teams try to amass victory points by solving threats. Each player controls a superhero team as well as the Archenemy of another team. Due to this mechanic, all players are permanently involved in the game and have many ways of influencing the events and developments on the map. The final victory condition depends on the current scenario. In most cases, the game ends when a team collects a certain number of victory points or after a fixed number of game rounds. Welcome to the HFC – Homefront Wargame Center! Welcome to the HFC website! This website is principally dedicated to Wargaming – board and card wargaming, and historical conflict simulations (for example Advanced Squad Leader). But since we are dedicated gamers, we aren’t afraid of looking beyond the borders of the wargaming world, so from time to time, you will also find postings about other games we play, for example Living Cardgames (Call of Cthulhu, A Game of Thrones), Fantasy boardgames (Arkham Horror, Marvel Heroes) or even videogames. In the course of transferring the contents from our old static website to the new format, we decided to drop some of the old articles (especially some very old and outdated reviews which will be rewritten from a fresh perspective). In addition, we added more contents and wrote new stuff and hopefully, this website will grow and prosper! In addition, you will find many travel reports and pictures – we love touring historical sites, not only of recent history (Ardennes, Huertgen Forest, A bridge too far at Arnhem, The Bridge at Remagen…), but also medieval and ancient sites, for example the 2000 year old Imperial City of Speyer! We hope you like the interactive, modern format and layout. You are cordially invited to leave comments, suggestions, share our articles, send in articles, or to share your own opinion on all topics with us. This site is a member of the Wargaming WebRing.